The B-2 Spirit follows the same ideas pioneered by John Knudsen Northrop, who founded Northrop to pursue his flying wing designs, and the Nazi Horten Ho-IX, one of the most advanced planes at its time, designed by the Horten brothers. The Ho-IX, also called Gotha Go 229 or Ho 229, took off for the first time in 1944 and was the only plane to meet Luftwaffe's chief, frustrated transvestite and absolute nutter Hermann Göring 1000-1000-1000 performance standards: the Horten was capable of transporting 1,000 kilograms of bombs (2,200 lb) over 1,000 kilometers (620 miles) at 1,000 kilometers an hour. Fortunately, it never reached production and most airframes were destroyed by US forces to avoid the Soviets getting their paws all over them. The U.S. VIII Corps of General Patton's Third Army captured one, however, and its low-drag, no-unnecessary surfaces live now in the B-2. Unlike the experimental Horten and the flying wing designs that Northrop designed in the 40s (like 1948's Northrop YB-49, a jet-based variation of the 1946's YB-35 strategic bomber) the Spirit became fully operational. The B-2 bombers are amazingly efficient: like its 20 sister vessels still in service, the Air Vehicle-12 Spirit of Kansas was capable of delivering both conventional and nuclear bombs to any target around the world in a few hours, with just one refueling. 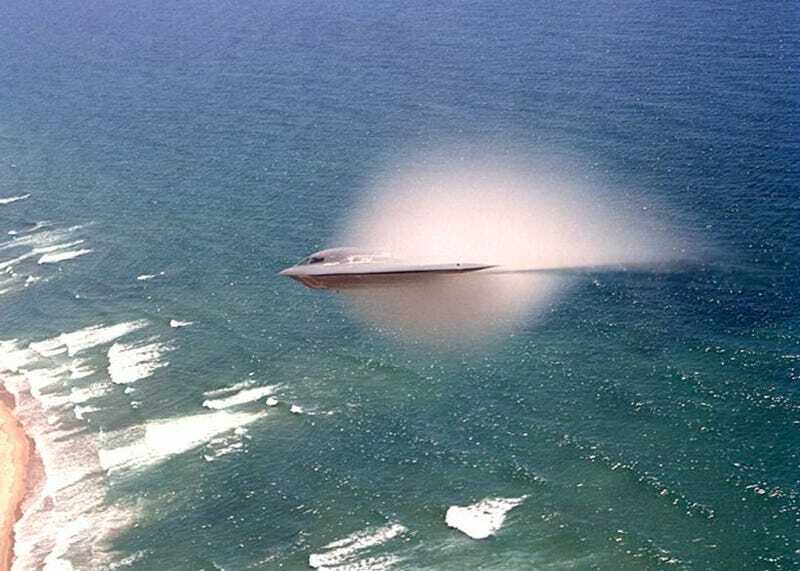 Powered by four General Electric F118-GE-100 turbofans capable of 17,300 pounds of thrust each, the aircraft can reach 410 knots (470mph) at a maximum altitude of 50,000 feet. Another advantage of its simple design —coupled with its radar-absorbing coating, called Alternate High-Frequency Material—is that their radar profile is extremely low. Coupled with its operational altitude, this make them extremely hard to detect and shoot down. That's the reason why this crash, with no known reasons yet, is so exceptional. That and the effect of watching $1.2 billion dollars disappearing in an crater in a concrete runway.